Perhaps no other feature contributes more to the beauty and tranquility of your poolscape than the sight and sound of falling water. Water effects can help transform your pool into a romantic oasis, a playful family water park, or a breathtaking focal point. 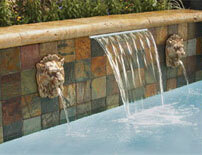 No wonder they are one of the most popular accessories in today's most elegant backyard retreats. The many options available allow you to integrate these mesmerizing water effects in either dramatic or subtle ways that transform any pool environment from great to spectacular. Vary flow to any water effect with an energy-efficient IntelliFlo� VF, IntelliFlo� VS-3050, or IntelliPro� VS-3050 variable speed pump to alter the height and distance of the water effect.